To teach kids how to write haiku, an educator should begin by explaining what haiku is, how it is constructed, and share examples of this poetry. Haiku is a form of poetry that began in Japan. Haiku uses the senses to describe scenes from nature, and often involves vivid images of trees, plants, seasons, and other elements of the natural world. Explain what haiku is and how it is a brilliant way to express the beauty that is in nature. Point out the five-seven-five rule regarding the syllable construction of haiku. Make sure that your students understand how to determine syllables in words, and review with them how to use a dictionary to find syllables when necessary. To help students with syllables, have them clap the words of each line of a haiku, and count with each clap. Have students write down potential subjects for their haiku. Because haiku describes the natural world, have them write a list of subjects, which can include animals, seasons, physical scenes, and more. Once your students have determined the subject and title for their haiku, have them begin writing lists of words that describe their subject. Of course not all of these terms will be utilized in their final poem, but a robust and descriptive list will give them a lot of words to choose from when drafting their haiku. Have them begin with their first line of five syllables. Teach your kids to describe ideas, be as vivid as possible, rather than trying to construct sentences or complete thoughts. As they proceed to their second, and longer line of seven syllables, your students will want to further the idea captured by the haiku. Remember to use ample praise and to guide them when they are stuck, offering suggestions for word usage. When the finish their haiku with the third line of five syllables, remind them that this line can be one or two words, and again, that they should aim for simplicity. You can also share with your class haiku that you or previous students have written, and remind them of the simplicity and beauty of all haiku, regardless of its authoring. To teach kids how to write haiku, try to use encouragement, rewards, and to capture their imagination throughout the process. You can do this by beautifully publishing their haiku, and having the student decorate the poem with scenes appropriate to their subject matter. Have haiku mounted on construction paper and other decorative paper, and post it on a bulletin board in your school or classroom. Create a booklet with all of your students' haiku and distribute it to your class for them to share with their parents and others. Use haiku in cards or invitations for family members and others. 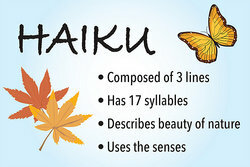 Teachers should be enthusiastic about haiku's beauty, and help students fall in love with this form of poetry. "Teach Kids How to Write Haiku." YourDictionary, n.d. Web. 25 April 2019. <https://education.yourdictionary.com/for-teachers/teach-kids-how-to-write-haiku.html>.